From 1968 to 1972, more than 130 airplanes in United States airspace were hijacked and taken to Cuba (many, but not all of them, with Florida as their intended destination). Eleven hijackings happened in the first six weeks of 1969 alone. "To facilitate impromptu journeys to Cuba, all cockpits were equipped with charts of the Caribbean Sea, regardless of a flight's intended destination. Pilots were briefed on landing procedures for José Martí International Airport and issued phrase cards to help them communicate with Spanish-speaking hijackers. (The phrases to which a pilot could point included translations for 'I must open my flight bag for maps' and 'Aircraft has mechanical problems—can’t make Cuba.') Air traffic controllers in Miami were given a dedicated phone line for reaching their Cuban counterparts, so they could pass along word of incoming flights. Switzerland’s embassy in Havana, which handled America's diplomatic interests in Cuba, created a form letter that airlines could use to request the expedited return of stolen planes." The book tells a fascinating tale. But what does this have to do with golf? 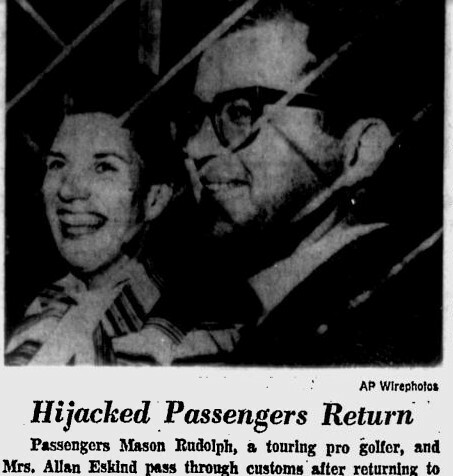 In 1968, the first year of the skyjacking epidemic, two professional golfers were on board flights that were hijacked to Cuba: Mason Rudolph and Barbara Romack. Romack was a U.S. Women's Amateur champion, won once on the LPGA Tour, and at one time was a vice president of the LPGA Tour. Rudolph won the U.S. Junior Boys Amateur Championship and then became a 5-time winner on the PGA Tour (twice winning by one stroke over runner-up Jack Nicklaus). Romack was the first to experience skyjacking. On Feb. 21, 1968, Romack was aboard Delta Airlines Flight 843 from Chicago to Miami. A man named Lawrence Rhodes pulled a gun on a stewardess, forced her into the cockpit, and ordered the pilot to fly to Cuba. Passengers said they were treated well during the airport stopover in Havana. Some were interviewed and photographed by Cuban newsmen, they said. Others brought back souvenirs including Cuban rum, some of which was consumed on the return flight, and political posters. "They gave us Cuban coffee and juice and permitted us to go through the airport," said Lex Hawkins, 42, a lawyer from Des Moines, Iowa. "We were given orange juice, lemonade, cigarettes and propaganda," said Don Bedwell, aviation writer for the Miami Herald, who was a passenger. Romack, as a minor celebrity, received some attention from the press when the passengers arrived back in the U.S., photographed wearing a blazer with "Barbie" stitched on it. "It was great," Romack said. 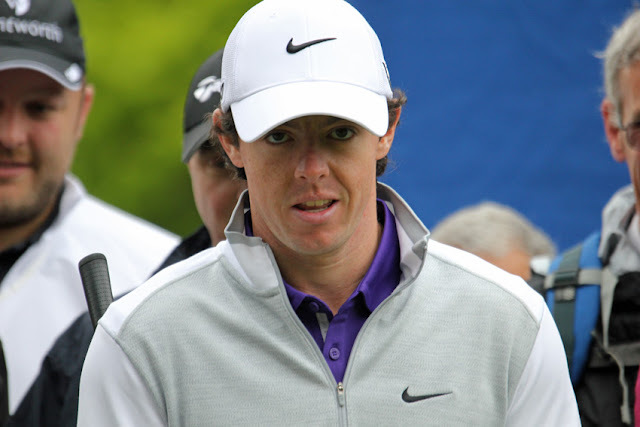 "I got more publicity out of this than when I won the Women's Amateur." 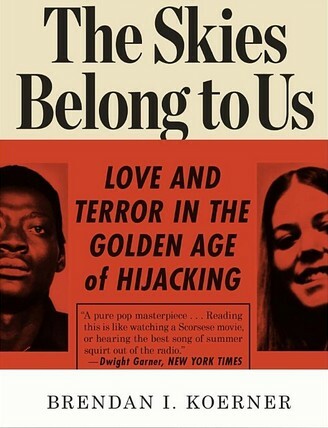 According to the author of The Skies Belong To Us, the hijacker, Rhodes, eventually made it to Spain before being returned to the U.S. He later was found guilty of a different crime, armed robbery, and sentenced to 25 years in prison. Rudolph's hijacking happened on Dec. 11, 1968. Rudolph was on board TWA Flight 496 from St. Louis to Nashville to Miami. The hijackers were a couple, a man (who carried a trumpet, according to news reports at the time) and a woman. Hey, love makes you do crazy things. Once the plane landed in Havana, Rudolph told the Associated Press in articles that appeared in print on Dec. 12, 1968, a Cuban soldier came around and "took down your names, addresses and occupations — I had a hard time getting over to him what a professional golfer was." Also on board Rudolph's plane was country music legend Tex Ritter (father of actor John Ritter). "It was not bad at all," Ritter said of the forced detour to Cuba. "I think most of the people rather enjoyed it." Imagine that! Skyjacking was so new and (mostly) not yet violent that some passengers apparently looked on the experience as an adventure. 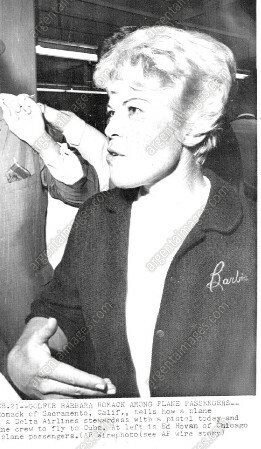 Once Rudolph and other passengers on the TWA flight were back in the USA, FBI agents showed them photos of fugitive Black Panther leader Eldridge Cleaver, thinking Cleaver might be the highjacker. The hijacker turned out to be James Patterson, who had brought his wife Gwendolyn along. After reaching Cuba, the couple dropped out of sight for a year, then turned up in Algeria alongside ... Eldrige Cleaver. According to author Koerner, their whereabouts today are unknown. Next time you're going through airport security, and you're angry and frustrated with delays and intrusions into your privacy and personal space, just remember: Once upon a time in America, airplanes were being hijacked at the rate of one per week.